Hostel & Camping. 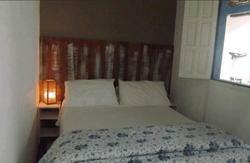 Excellent location, 2 minutes walk from the main beach (Concha) and 5 minutes from the main street (Pituba). Direct trail to the pristine surf beaches (Resende). Super relaxed area in the midst of nature. Shared room with fan and mosquito net, two shared bathrooms with shower and hot water. Camping area with electricity, 4 bathrooms, 4 showers and 2 outdoor showers. BBQ area and WIFI. From the Airport of Ilheus please go to the bus station, take the bus to Itacare. We are 15 minutes away from the highway and 5 minutes by taxi. Beside the Pousada Aldeia do Mar, Concha beach.